FIVE DECADES before "Walt Disney Pictures" released "Pirates of the Caribbean: Curse of the Black Pearl" and Johnny Depp donned the costume of "Captain Jack Sparrow". 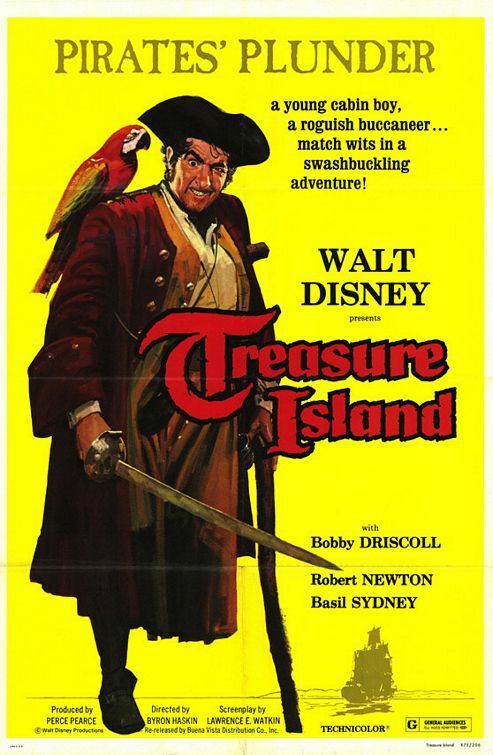 Walt Disney himself made Robert Lewis Stevenson's "Treasure Island" and ROBERT NEWTON was "LONG JOHN SILVER". Perhaps earlier, but at least since 1916 when Lillian Gish portrayed Daphne La Tour in the silent feature "Daphne and the Pirate". The World has been in love with Pirates aka: Swashbucklers aka Buccaneers in motion pictures. Among the swashbuckling movies that followed "Daphne and the Pirate" were Douglas Fairbanks, Sr. as 1926's "The Black Pirate". Twenty-one years later Douglas Fairbanks, Jr. fought a group of pirates after Alexander the Greats Treasure in "Sinbad the Sailor", but back in 1935 movie goers had watched Errol Flynn as the dashing "Captain Blood". While Tyrone Power portrayed "Jamie Waring" in 1942's "The Black Swan". 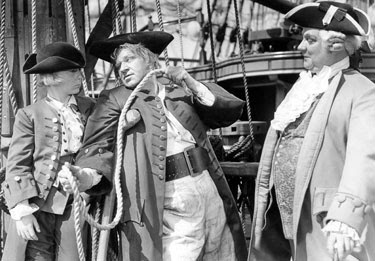 Charles Laughton was cast as the Buccaneer "Captain Kidd" in 1945. During 1952 audiences viewed Maureen O'Hara as Lady Pirate "Prudence 'Spitfire' Stevens" in "Against All Flags", That same year acrobatic Burt Lancaster swung from the yardarms as "Captain Vallo" in "The Crimson Pirate". Lancaster's "Vallo" is considered the "Grandfather" of "Jack Sparrow" by both Johnny Depp and Jerry Bruckheimer. The list of actors playing pirates goes on including Peter Cushing, Yul Bryner and Kevin Kline. Even cartoon characters "Crusader Rabbit", "Bugs Bunny" and "Scooby-Doo" became involved with pirates over the years. 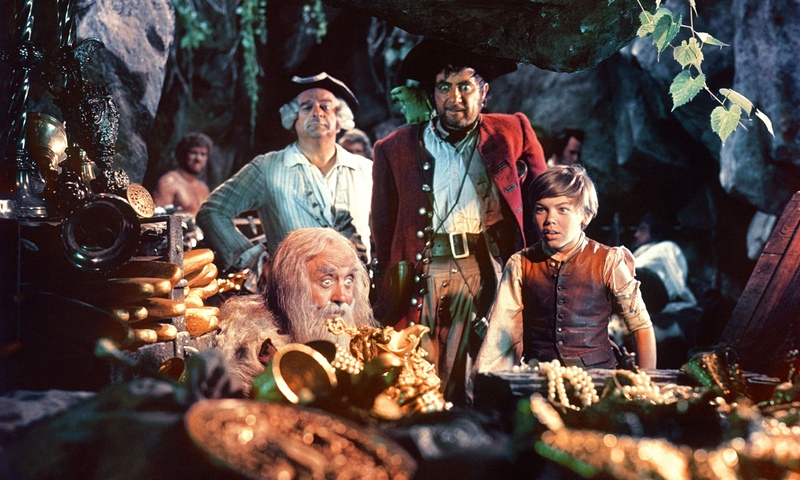 So it wasn't a real gamble in 1950 when Walt Disney decided to make Stevenson's "Treasure Island" for the 10th time. 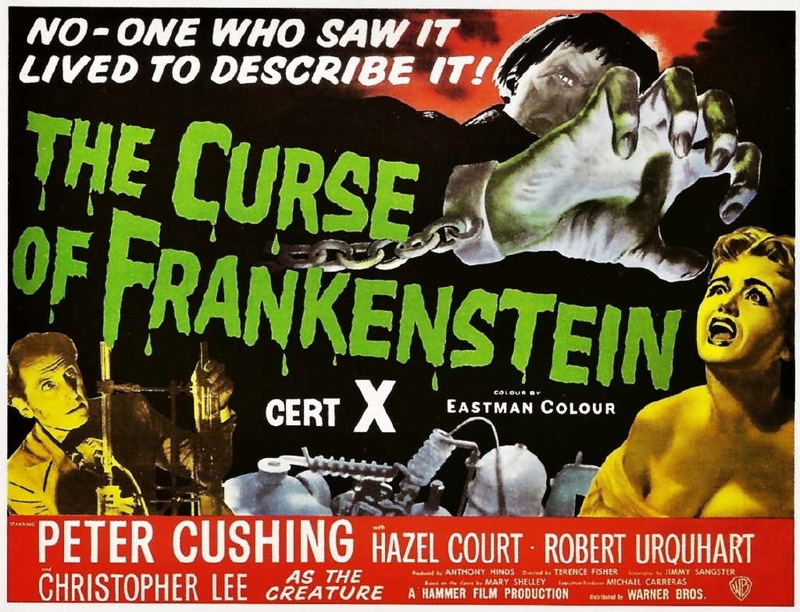 The proposed film had three things going for it: Pirates, Disney and the first Technicolor filmed version of the original novel. 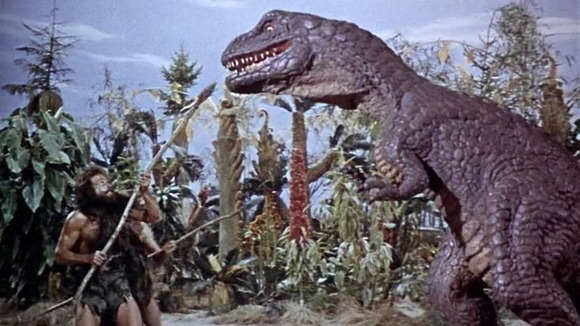 This feature was the first of a group of four UK based motion pictures Walt Disney would make. It's actual purpose was to avoid paying taxes to both England and the United States. Like many other major American movie studios. Walt had money gathering interest in British banks since the outbreak of World War 2. With the war over to obtained these funds Disney's would have been taxed twice. Once by England for removing the money from the their banks and once by the United States for bringing the money into the country. The solution was simple, and the reason the British set up their tax, make movies in the UK with British crews. The main concern for this production was who should play the villainous rogue "Long John Silver"? The part is the most critical to the story and over the years had been portrayed in various ways. Although there are stories of a 1908 film version made by a known animator. The first confirmed on screen treatment of the Robert Louis Stevenson novel was 1912's "Treasure Island". I could not locate any stills from it, but the first actor to play "Long John Silver" would appear to have been Benjamin "Ben" F. Wilson. The second version of the story is of interest because it was produced with a cast of children and released in 1918. The story turns out to be Jim Hawkins dreaming about pirates. 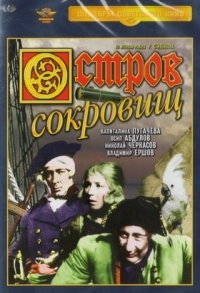 Portraying "Long John Silver" was child actress Violet Radcliffe. In fact Violet portrayed only male roles over her short career and life. Here is Miss Radcliffe's story from the website: "A Gender Variance Who's Who". The still below is from Mark Twain's "The Prince and the Pauper" and the young actress is on the left. Violet made her first film at age 6, her last at the age of 10, and was dead at age 18. In 5 years, from 1914 to 1918 she made 34 films. She finished her career in Fox's Sunshine Kiddies films, children's stories with most parts played by children, in which she played male villains. She was Prince Rudolpho in Jack and the Beanstalk, 1917, the evil magician, Al-talib in Aladdin and the Wonderful Lamp, 1917, the Robber Prince in The Babes in the Woods, 1917, Long John Silver in Treasure Island, 1918, and the Chief Executioner in Fan Fan, 1918. 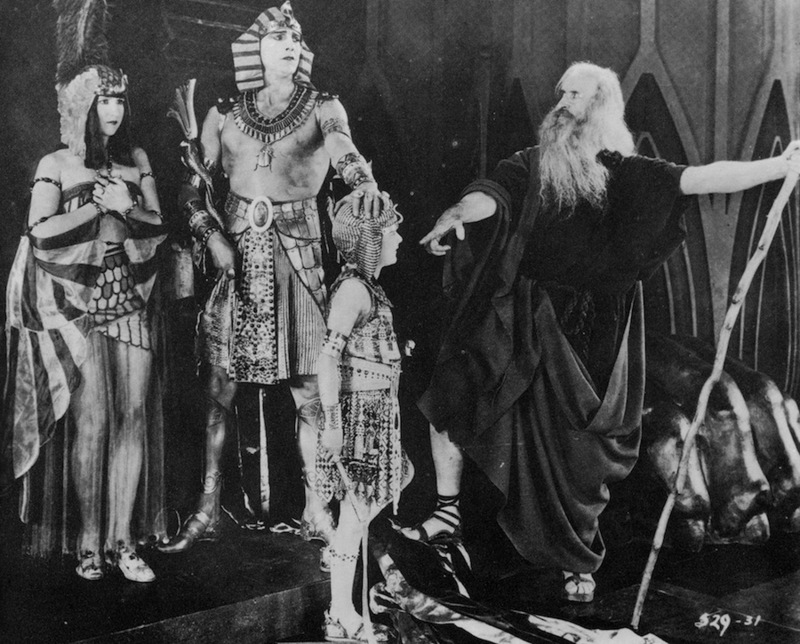 Two more silent versions of the story would be made prior to 1934. When MGM filmed the first sound production starring Wallace Berry as "Silver" and 11 year old Jackie Cooper as "Jim Hawkins". Wallace Berry's characterization would remain the most known, although the film was considered a disappointment at the box office, for the next 16 years and the first to be seen on television upon the release of the Disney feature. Also there was no attempt for Berry, or Cooper to have British accents and most of the cast were American born. This Russian version of Robert Louis Stevensons Treasure Island was made in 1937 at the height of Stalins repressions. As one should expect, the story was adapted to fit into the communist world of that time. For example, good people do not seek treasure for themselves (selfish) but instead try to help liberate the working class, which in this case is to buy arms for the Irish rebellion in the 1790s. So at the very beginning you see Dr Livesey as a revolutionary being chased on horseback by the English army and finds refuge at the Benbow Inn. However, except for the very beginning and the very end, the story is basically the one you already know with one notable difference - young Hawkins is actually Jenny Hawkins, who signs on the Hispaniola as cabin boy Jim to be near her love, Dr. Livesey. 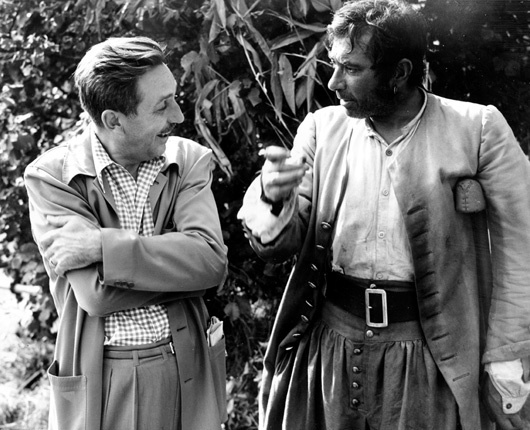 Walt Disney would cast British actor Robert Newton as his "Long John Silver". Director Bryon Haskin together with Newton would create not only the definitive characterization of Robert Louis Stevenson's pirate rogue, but the model for most motion picture pirates that followed. Including two years later when Newton portrayed "Blackbeard the Pirate" for RKO. The original distributor for Disney of "Treasure Island". 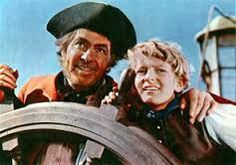 Below Robert Newton as "Long John Silver" with Bobby Driscoll as Jim Hawkins. Born June 1, 1905 in Shafterbury, Dorset, England. Newton was called their role model by British actor Oliver Reed and rock band drummer Keith Moon of the "WHO". 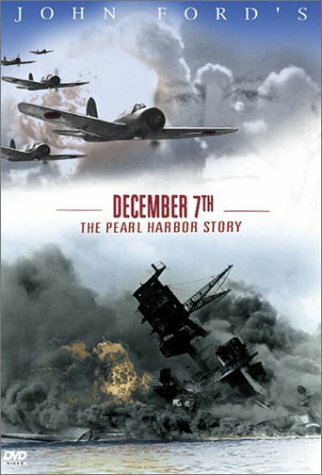 After Robert Newton's first 14 motion pictures, starting in 1924, and at the time World War 2 came to England. Newton was considered as popular, by young boys, as Errol Flynn. During the war the actor served on the minesweeper HMS Britomart on convoy duty. He also continued acting to help the country's morale when not at sea. Robert Newton was a character actor and prior to making "Treasure Island" was seen in various roles. He appeared with Charles Laughton and Merle Orberon in 1937's "I, Claudius" and with Laughton and Maureen O'Hara in Alfred Hitchcock's 1939 "Jamaica Inn", Newton co-starred in the 1940 original version of "Gaslight", which he would recreate on the London Stage in 1950, and in 1941's "Major Barbara" written by George Bernard Shaw starring Wendy Hiller and Rex Harrison. 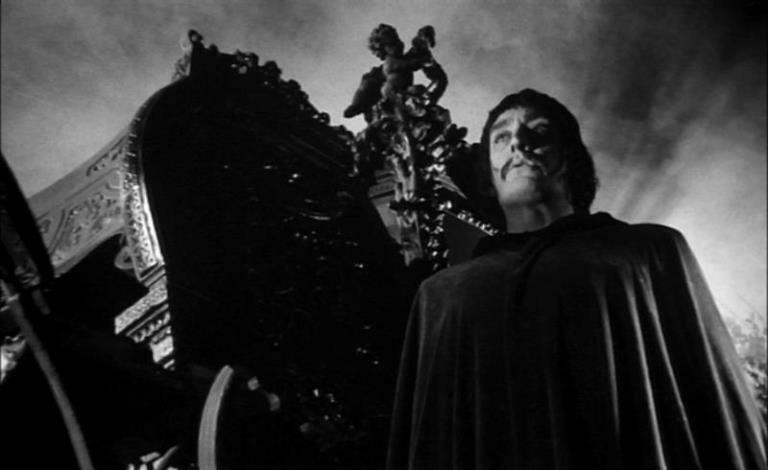 1944 saw the actor in his friend Laurence Olivier's "Henry V". Four years later the audience lovingly hated his character of "Bill Sykes" in director David Lean's 1948 masterpiece filming of Charles Dickens' "Oliver Twist". Robert Newton followed that performance the same year with another evil person, He portrayed the manipulative crook "Harry Carter" in "Kiss the Blood Off My Hands" starring Burt Lancaster and Joan Fontaine. During the year prior to "Treasure Island" Newton portrayed "Dr. Clive Riordon". "Riordon" plans a calculated revenge and unique murder of his wife and her lover in "Obsession" aka: "The Hidden Room". In short Robert Newton was noted for creating detailed characters that kept the audiences attention. "Long John Silver" and "Treasure Island" The Look! Take a glance at the picture of Wallace Berry, above, and you will see how Hollywood normally portrayed Pirates. Basically a man with a head scarf so the actor could be recognized by the audience and the costs kept down. This look continued with Tyrone Power in 1942's "Black Swan". Occasionally there was a Buccaneer character with a more elaborate costume, but it was normally used to make one stand out over the rest of the cast. The character was also more than likely the pirate and governor of Jamaica Henry Morgan. A favorite in Hollywood. Below actor Laird Cregar as "Henry Morgan" from "The Black Swan". 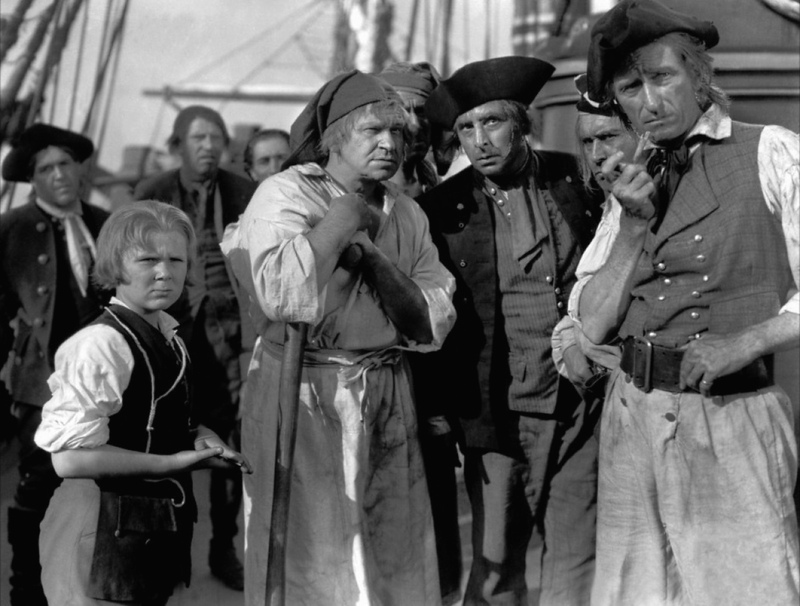 Hollywood gave a little more detail to 1945's "Captain Kidd, but even Charles Laughton's title character, below center, seems more like any other merchant at the time. Also note that the crew even with long side burns and mustaches seemed clean shaven and especially Gilbert Roland on the left. Above Tyrone Power seemed like he had just walked out of the barber shop after a haircut and shave. After 29 years the motion picture image most people associate with pirates had yet to be truly established. 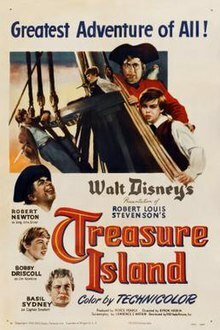 This changed with Walt Disney's "Treasure Island" and Robert Newton's portrayal of the Robert Louis Stevenson character. Along with the decision to make the crew seem more real looking for pirates, or just ordinary merchant seamen of the period. The difference is obvious when you look at the still from "Captain Kidd" and the one below from the Disney feature. Should you research the look, voice and mannerisms that the majority of people around the world think of when mentioning pirates. You will find two main entries. These are Robert Newton as "Long John Silver" in Disney's production of "Treasure Island" and the Disney pirate character of "Captain Hook" from "Peter Pan". Which is also based upon Robert Newton. Director Bryon Haskin and Actor Robert Newton wanted "Long John" to blend in, but still stand out over the over characters in the motion picture. They worked with the non on screen credited Costume Designer Sheila Graham on his clothing and the color choices for them. When we first meet Newton's "John Silver" as both an Inn Keeper and Cook. He is dressed typically like a British merchant of 1765 Bristol. This is important in creating the illusion that he never was a pirate and because he is in port. This "John Silver", Inn Keeper, is clean shaven. That would change during the story. For comparison I return to the 1934 version. In it Wallace Berry will wear the same basic clothes throughout the picture, but add or remove an apron and a small or great coat. In the first scene below Berry with some of his pirate crew have been at sea, but remain clean shaven and their clothes appear washed and pressed. The second scene shows Berry in the same clothing as the two previous stills, but with a great coat on. 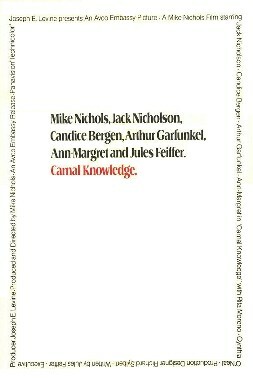 The following poster for the Walt Disney release. Shows what became the "Classic" Pirate look associated with the character of "Captain Long John Silver" and pirates in general. Variations of this costume would be used throughout the many films of the 1950's and early 1960's around the world. Robert Newton's basic look would be updated and revamped for Johnny Depp as "Captain Jack Sparrow" those five decades later. The following three stills show not only different costumes for Newton's character, but more importantly the facial expressions of Robert Newton that help bring "Long John Silver" to life. Many proposed Pirate features which had not started filming changed to Newton's look by the following year. 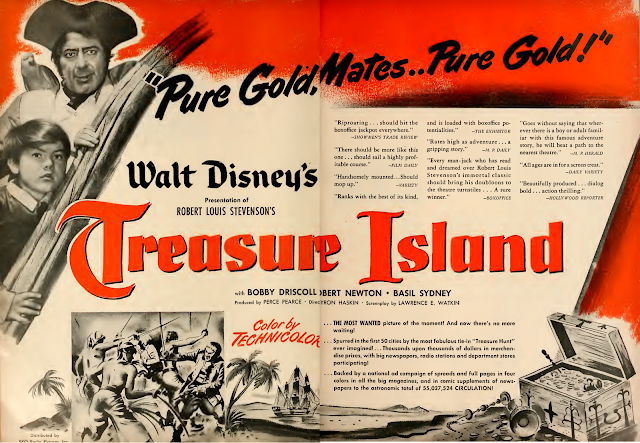 This was based upon the unprecedented World wide response to Walt Disney's "Treasure Island" and Robert Newton's characterization. 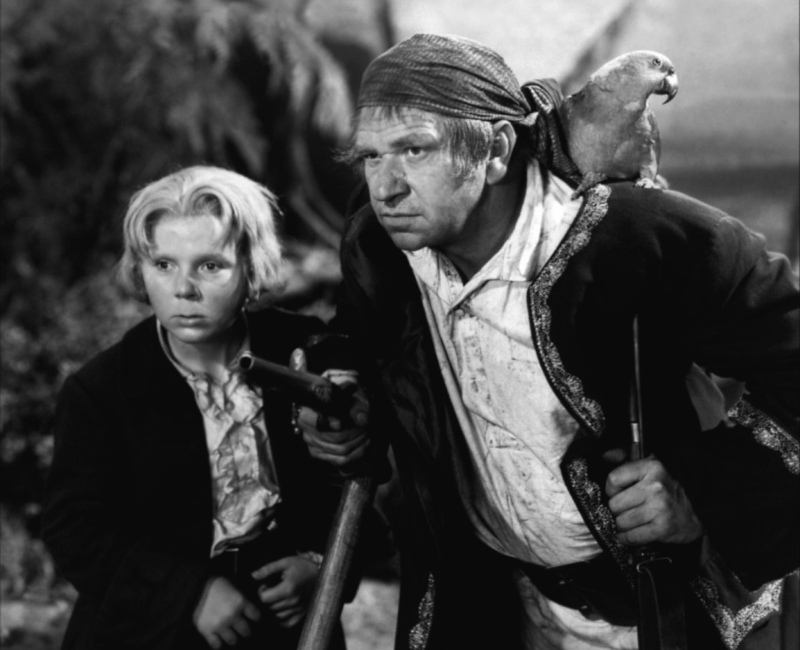 Those changes further helped solidified Robert Newton's "Long John Silver" as the stereo typical motion picture pirate. 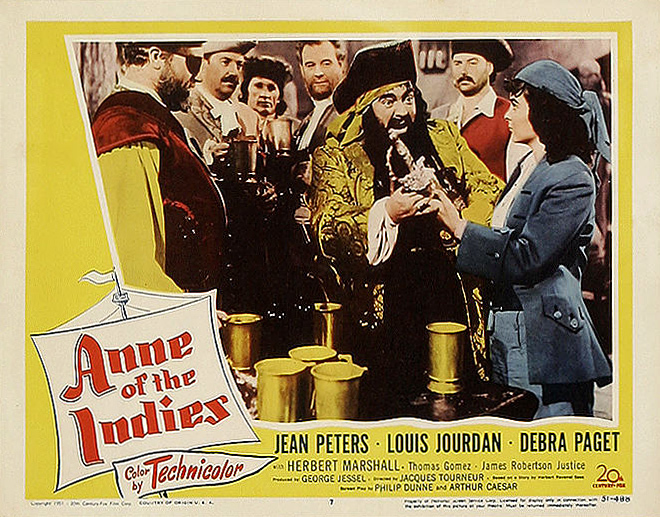 The following lobby card for 1951's "Anne of the Indies" shows Thomas Gomez as "Blackbeard". Note how close to Newton's his costume is designed. Speaking of Edward Teach. 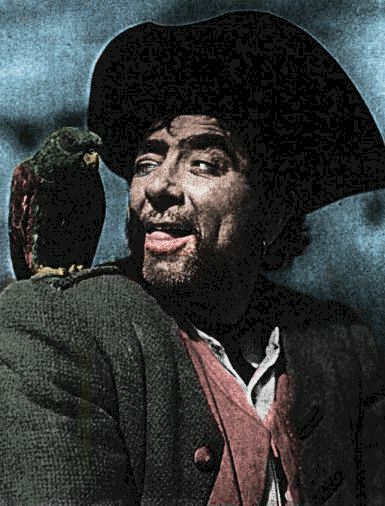 In 1952 Robert Newton appeared in the title role of "Blackbeard the Pirate" directed by "One-Eyed" Raul Walsh for RKO. The company that distributed Disney's "Treasure Island". Except for a change of hat and that beard. This poster's picture of the actor as "Blackbeard" could be "Long John Silver" too. And the look was again revamped in 1960 for Bert I. Gordon's fantasy feature film starring Charles Herbert "The Boy and the Pirate". Once again the young audience the film was aimed at has the ever popular Edward Teach aka: "Blackbeard". The craze for pirate films would reach Italy and Spain. 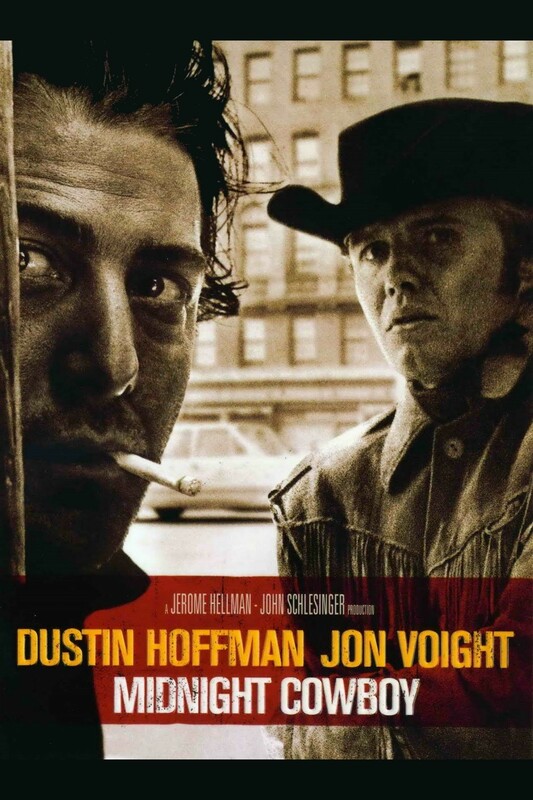 In the period between making "Sword and Sandal" epics and the emergence of the "Spaghetti Westerns". Italian and Spanish costume designers would go back to pirates wearing scarves and leading men, at times, wearing Spanish influenced versions of the basic Robert Newton look. 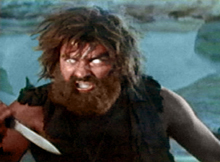 Steve Reeves moved from "Hercules" to "Morgan the Pirate". While Sean Flynn, advertised as "The Son of Errol Flynn", became "The Son of Captain Blood" in an Italian made movie. 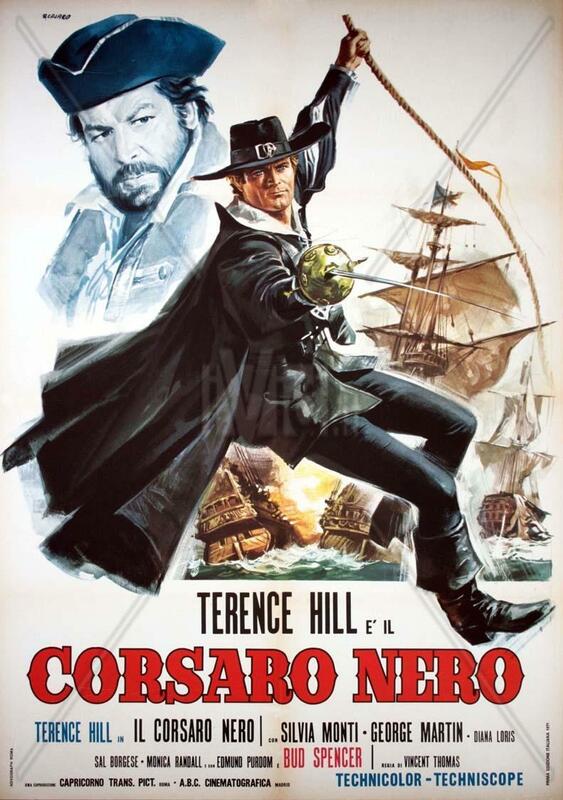 Below the poster for the Italian pirate film "Blackie the Pirate" starring Italian/American actors Terence Hill and Bud Spencer. According to both Scottish Historian Dr. Angus Konstam in his 2008 work"Piracy: The Complete History", published by Osprey Publishing and found on page 313. Along with Dan Parry in his 2006 "Blackbeard: The Real Pirate of the Caribbean". published by the National Maritime Museum, London, England, on page 174. 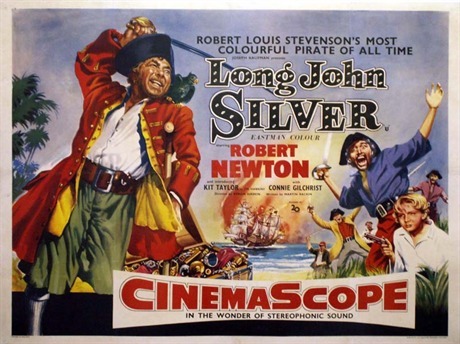 Robert Newton's "Long John Silver" is the "Standard" for motion picture portrayals of "Historic Pirates" and Newton's voice was credited by both authors for creating "the stereotypical pirate voice" and dialogue. Robert Newton had what is known in England as a "West County" accent. The "West County" covers Cornwall, Devon, Dorset, Somerset, Wiltshire, the City of Bristol, Gloucestershire, Herefordshire and Worcestershire. The "West County" has always been associated with farming and earned the stereotype that farmers are "rustic and illiterate". The people of the South West have long endured the cultural stereotype of 'ooh arr'ing carrot crunching yokels' , and Bristol in particular has fought hard to shake this image off. Robert Newton decided to take his accent, which he had been keeping out of most of his performances, and play it for all it was worth as "Long John Silver". Director Byron Haskin knew Newton was also a "Ham", at times. and turned the actor loose. The result to use an overly done term was "CLASSIC". Many motion pictures and television programs dealing with Pirates had actors, even if not from the "West County" or British at all, attempt to reproduce his voice patterns and delivery In the "Pirates of the Caribbean" series of motion pictures. Geoffrey Rush's "Captain Hector Barbossa" is very much Robert Newton's "Long John Silver" and the Australian actor's delivery of his lines is done with a close "West County Accent". Created in 1995 in the State of Oregon by John Bauer and Mark Summers is "Talk Like A Pirate Day". The day is celebrated every September 19th and over the years has become International. Te idea is all day you use words and sound like a pirate. In recognition of his work and always referred too as the "Patron Saint of Pirates" is Robert Newton. In 1954 Bryon Haskin directed a co-production of the United States and Australia based upon Robert Louis Stevenson's "Treasure Island", but taking place after the events of the novel. 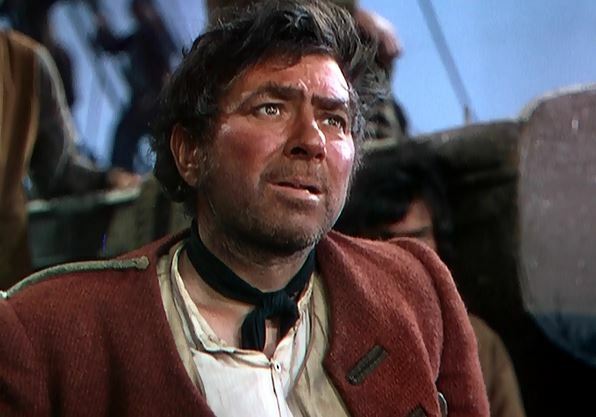 Returning in the role of "Long John Silver' was Robert Newton. From a technical point of view this was the first wide screen motion picture made in Australia. Portraying Jim Hawkins was 12 year old Australian actor Kit Taylor. Playing the role of the owner of an Inn "Silver" lives and works at was American actress Connie Gilchrist as "Purity Pinker". "Purity" is in love with "Long John" and in some comic situations keeps attempting to get him to marry her. In the original Walt Disney motion picture and the novel. There is a scene with Jim Hawkins returning to the ship the "Hispaniola" and cutting the anchor rope to get it away from the pirates. On board is Israel Hands who goes after Jim and chases him up into the ship's rigging. 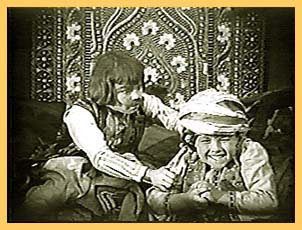 Jim is injured by a knife thrown at him, but the boy uses his pistol and kills the pirate. Who falls into the bay and is not seen again. The new picture has Jim and the local Governor's daughter kidnapped by the pirate "Captain Mendoza" known as "El Toro". It's up to "Long John Silver' to save them. This leads back to "Treasure Island" and a search for a second chest buried by "Captain Flint". On the island is Israel Hands who was not killed. 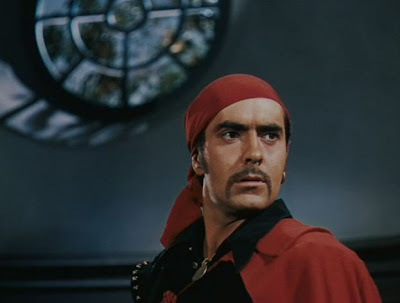 Playing the pirate out for revenge against Jim, above, in his second motion picture appearance was Rodney Taylor. Who shortly would be known as Rod Taylor. This motion picture is also known as "Long John Silver's Return to Treasure Island" and "Return to Treasure Island". 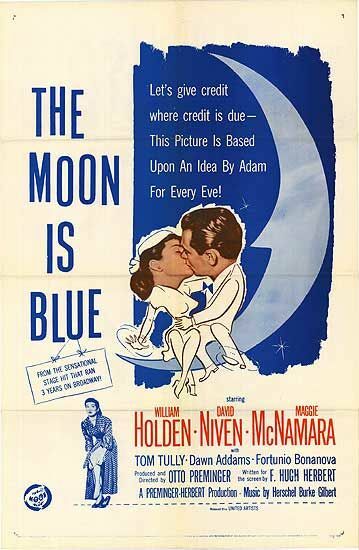 That last title caused confusion when used in the United States, because of another movie of the same title released in 1954. 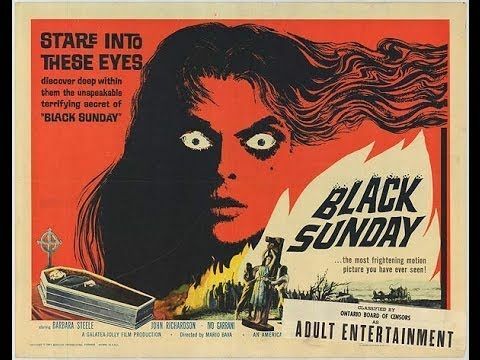 The second feature stared Tab Hunter and Dawn Addams and was set in modern times. In that picture adventures search for "Flint's Treasure" using Robert Louis Stevenson's novel as an actual historical document with clues. After "Long John Silver" was made and released. Bryon Haskin became the primary director of a 26 episode television series shot on the Australian sets "The Adventures of Long John Silver". 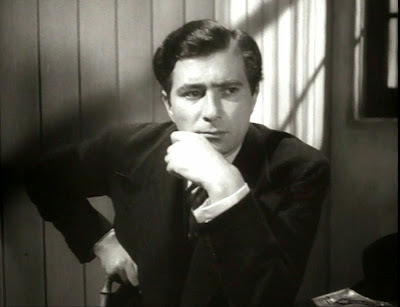 Once more you had Robert Newton as the title character and both Kit Taylor and Connie Gilchrist returned in their roles. 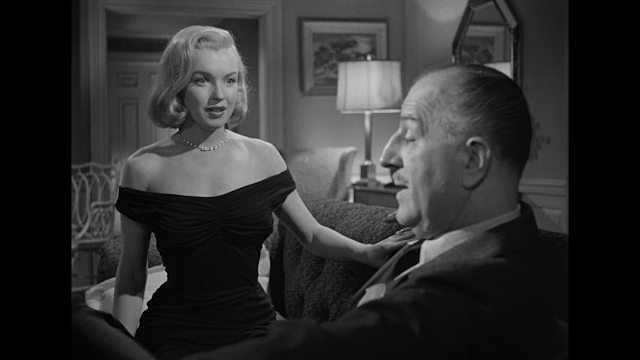 Although the show was filmed in 1954. It was not shown in the United States until 1956, the UK until 1957 and Australia not until 1958. Robert Newton's final role was that of "Inspector Fix" chasing after David Niven's "Phileas Fogg" and Cantinflas' "Passepartout" in Michael Todd's version of Jules Verne's "Around the World in 80 Days" released October 17, 1956. 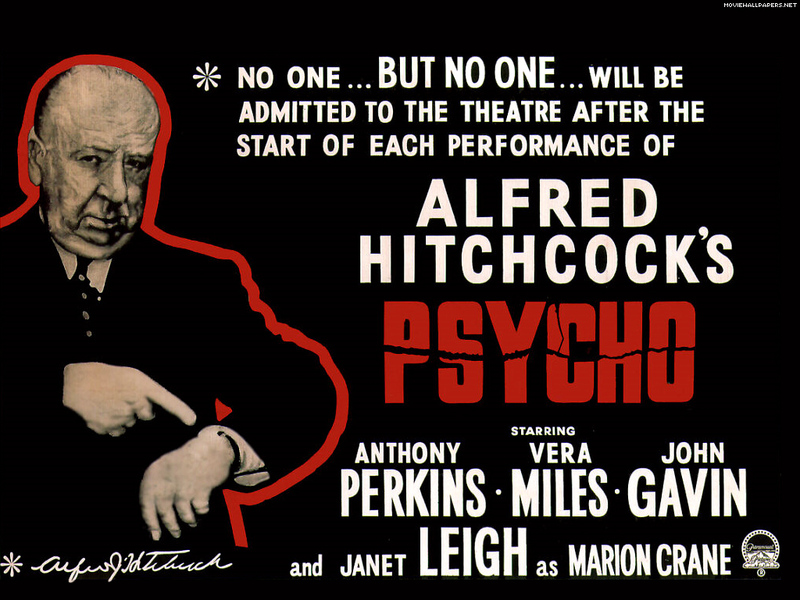 Unfortunately the actor never saw the finished motion picture as he died from a heart attack on March 25, 1956. Robert Newton had been married four times and had three children. Initially he was buried at the Westwood Village Memorial Park Cemetery in Los Angeles. However, years later his son Nicholas had his father's body cremated and took the ashes back to Mount Bay, Cornwall. It was there Robert Newton had spent his childhood. 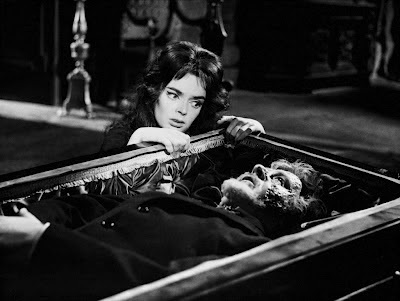 The actor's ashes were scattered over the sea around the bay. A fitting end for "Long John Silver". Drink and the devil had done for the restYo ho ho and a bottle of rum.